UDM Downloads > Ezi Accounting Software for business! Ezi Accounting is a low cost easy to use accounts and invoicing program for small to medium sized businesses. Simple user interface interface in English, Spanish, Arabic, French, Portuguese with powerful security. Standard accounting functions include Invoicing / Quotation, Clients details, Sales Analysis, Clients Statements, Aged Clients, Purchasing / Purchase Orders. Reports include Purchase Analysis, Stock Analysis, Bank Reconciliation, Assets, Liabilities, Equity, Income, Cost of sales, Expenses. 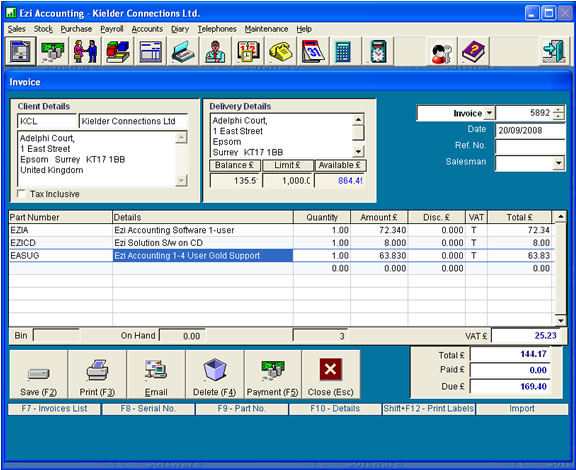 Built in e-mailing of invoices + quotes. Currency, tax, setup, forms can be localised to suit most countries. Facilities to import and export data to other packages. Integrated help. Available boxed or as a download, with 30 day full function trial.